Parents and coaches of young baseball players know the drill: no curveballs. The edict is based on the potential for injuries in young pitchers due to the mechanics involved in delivering the pitch. But recent studies have fueled the debate as to whether risk of injury from throwing curveballs actually exists. “For years, we told people that curveballs were bad. Then we set out to prove it. We did not prove curveballs are safe, but we could not prove they were dangerous,” said Glenn Fleisig, the research director of the American Sports Medicine Institute, who has conducted studies on breaking balls and young arms since 1996. The force of throwing a curveball is no greater than for a fastball when the proper mechanics are employed. But many kids either don’t have proper mechanics, enough neuromuscular control, or are fatigued when throwing curveballs, according to James Andrews, an orthopedic surgeon and a founder of ASMI. 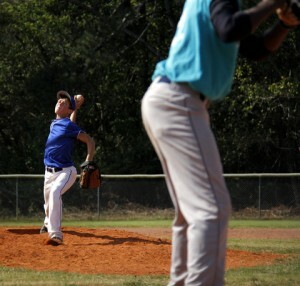 A study by the University of North Carolina was conducted on more than 1,300 pitchers aged 8 to college age. The study was commissioned by the Little League and USA Baseball leagues. The pitchers were observed over a five year period, annually assessing the number of innings pitched, types of pitches thrown, number of teams played for and any arm pain or injuries experienced. “There was no association betw een throwing curveballs and injuries or even arm pain,” said Johna Mihalik, author of the study. Dr. Timothy Kremchek, an orthopedic surgeon and Cincinnati Reds’ physician, thinks Little League’s position is irresponsible. It’s his opinion that Little League has an obligation to protect the young players but are instead are saying, “There’s no scientific evidence curveballs cause damage, so go ahead, kids, just keep throwing them.” Medical professionals who have to treat those players a few years later are pretty sure there is a cause and effect, according to Kremchek. Others wonder if asking whether the curveball is safe is the wrong question and whether overdoing it is the problem. It’s been proven scientifically that too much throwing leads to injury, and sometimes serious injury. I’m on the USA Baseball Medical and Safety Committee with Glenn Fleisig. Based on the studies that I’ve seen, the quantity of pitches in a season is the number one predictor of elbow/shoulder pain in youth baseball. As for curveballs, it’s important to give more weight to scientific research than anecdotal observations. However, additional studies should be performed on the impact of proper techniques vs. improper technique when throwing curveballs. The USA Baseball Medical and Safety Committee has a number of excellent articles on youth baseball safety.